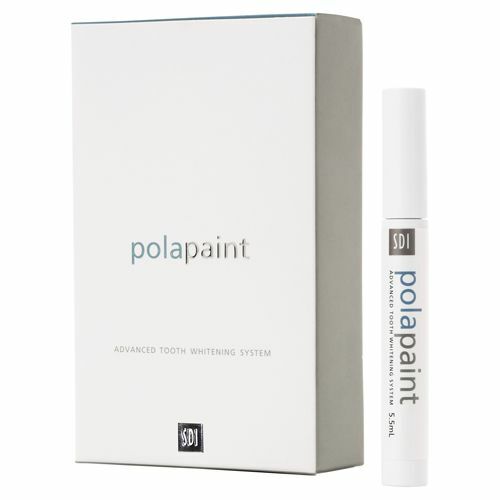 Pola paint is a fluoride releasing mint-flavoured paint on teeth whitening system. Within seconds, you can apply Pola Paint directly onto your teeth, whenever you wish! The fast drying whitening gel forms a clear invisible film on your teeth – no one will notice, so you can continue your normal routine without anyone knowing you are whitening your teeth at the same time! Keep it in you handbag or top pocket! It’s stronger than products available in the supermarket or pharmacy – so, it will work better and faster! Pola Paint is the perfect product to maintain your white smile. Pola Paint contains 8% carbamide peroxide. Brush and floss teeth as normal. Blot dry the front surface of teeth. surfaces of the teeth, re-loading brush as required. After application do not let your lips touch your teeth for 30 seconds. this time to maximize results. Use Pola Paint twice a day for 14 days. firmly replace cap to prevent gel from drying out.